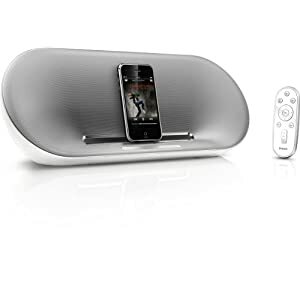 This is an update to the unfinished post from last year where i used online reviews to identify the best ipod dock for under £100 as part of my researching a gift for my GF’s Christmas present. Today sees this post updated (she decided she didn’t want one last year but wants one this year… women!) with not only new ipod docks, but also my personal reviews from having played with them in store. Contrary to last years post, I won’t be recommending the B&W Zeppelin (best price £499 at Amazon) as having listened to both this and the Bose SoundDock (Best Price £399 at Amazon) (, the zeppelin sounded really tinny (tested with Jump In The Pool by Friendly Fires) so the winner in whats the best ipod sound dock with no money limits, then i’d definitely go for the Bose. This is a good looking piece of kit, has sound comparable with the Bose for roughly 1/2 the price. Its a little more expensive than my target of £100 however i’m seriously considering it.